Guitarist Corey Parsons sits down with The Local to discuss the band’s goals, influences and accomplishments. 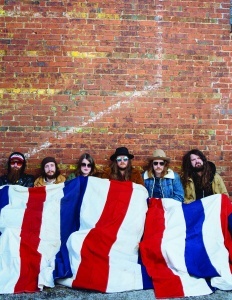 The Banditos are natives of the Birmingham area, but currently live in Nashville as they pursue their music career fulltime. The band is comprised of six friends who describe themselves as more of a “gang” than a musical group. This rag-tag gang has been making music together for more than five years now. They started out playing in bars and out on the streets around downtown Birmingham. Now, they have put out a full-length, self-titled, album with a second album on the way. Guitarist Corey Parsons recently discussed the band’s journey with The Local. What has been the biggest challenge that you have overcome as a band? Being able to make a living by playing music is a challenge within itself. How does the music you play relate back to your everyday lives? Definitely, most everything we write has came from personal experience. And if not, it certainly does now. What other artists (past or present) inspire you? Too many to name, but I’ll name a few that come to mind for the sake of the interview. Chuck Berry, Etta James, Gram Parsons, Ramones, Lightnin’ Hopkins, 13th Floor Elevators, Sly and the Family Stone, Dr Hook, Bob Seger, The Banana Splits, etc. What are the band’s long term goals? To do our best to smooth the rough edges of life for anyone needing so. What would you want your fans to know about the band that they might not? We’re genuinely appreciative of them. What inspires the lyrics for y’all’s songs? It’s different every time, but we all take from personal experiences in some way or another. What has been y’all’s biggest accomplishment so far? We just finished recording our second album. We’re pretty proud of it.